The Trialogue Business in Society Conference is an annual industry-leading event which brings together development stakeholders from the corporate, non-profit, government, academic and media sectors to share lessons and innovations for enhanced and lasting impact in development. 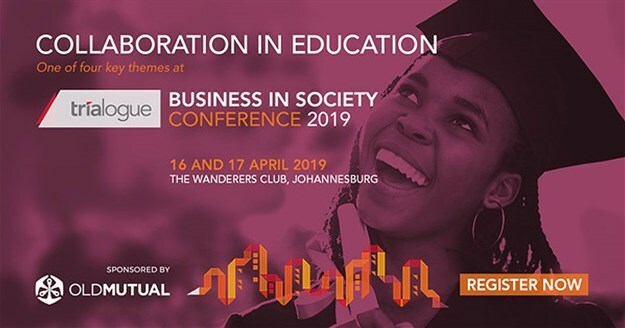 One of the four key themes at this year’s conference – collaboration in education, presented in partnership with Old Mutual, will underscore the importance, address the barriers and provide practical tips and implementation tools for how corporate, government and the non-profit sector can work together to realise equitable access to quality education in South Africa. Collaboration in education sessions will include insight from the Department of Basic Education, Old Mutual Foundation, DG Murray Trust, Stellenbosch University, JET Education Services, Reos Partners Southern Africa, the National Education Collaboration Trust and the Public Health Enhancement Fund, among others. Other themes at the conference are innovative finance for development impact, presented in partnership with Absa, managing risk and reputation in development, presented in partnership with Sasol and building healthy relationships in development, presented in partnership with Vodacom.